This weekend my dad turns 63. 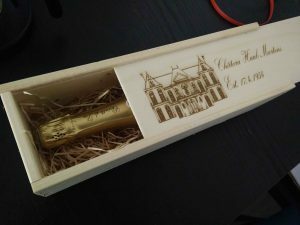 This year I created a very personal gift for him: a laser engraved wine box. Recently my local library opened a fab lab (fabrication laboratory). For only a few euros you are allowed to use the machines they have. With three 3D printers, a laser cutter, and a dye-sublimation printer, children can learn a lot about working with technical devices. To create a personal gift I decided to create a laser engraved wine box with the favorite wine of my dad. I bought a black wooden wine box at my local liquor store. To create the design I downloaded an image with a “french looking” house on it. Using Inkscape this image was converted to a vector graphic.